Feature Kitchen: Weather or Not? 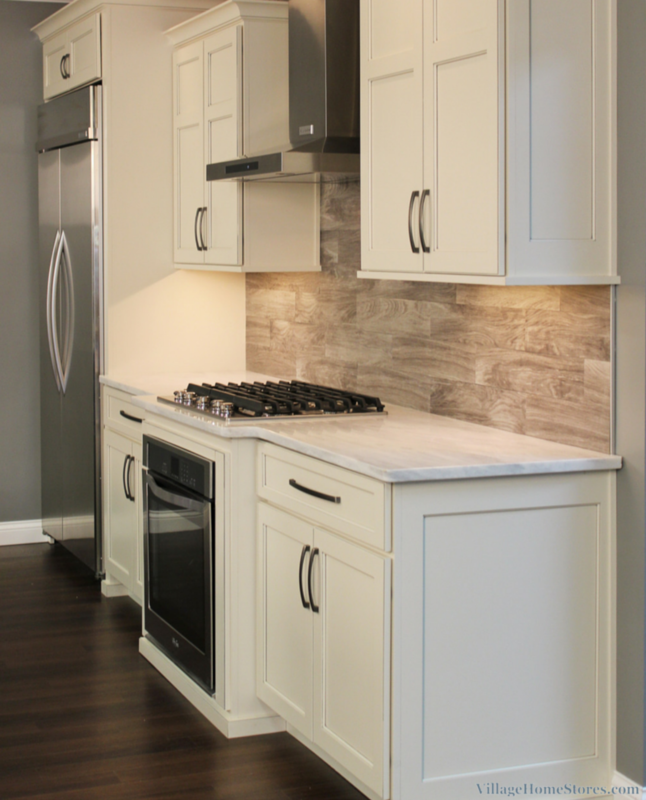 Prefer the smooth look of a painted kitchen cabinet? Or is a rustic weathered look more your taste? How about a perfect blend of each!? 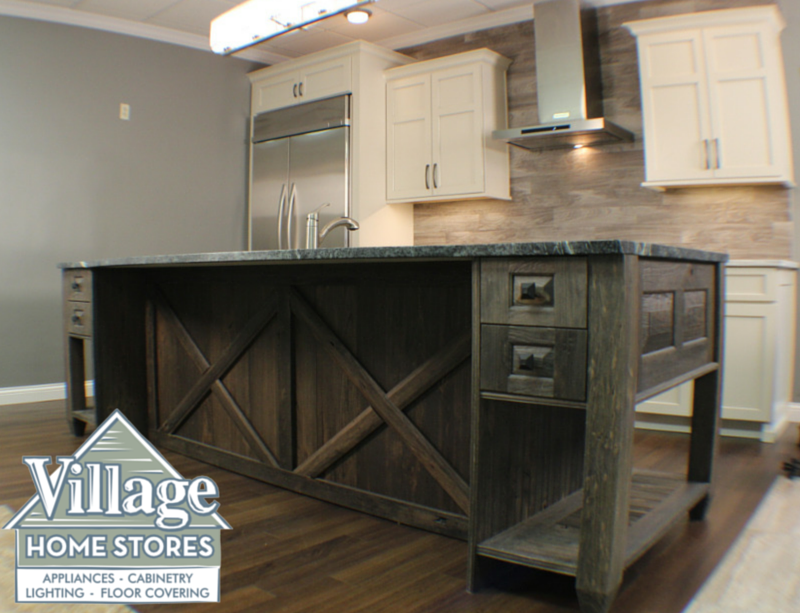 Our newest display kitchen in the Village Home Stores showroom is today’s featured kitchen! This kitchen was our booth display for this Winter’s Quad Cities Builders and Remodelers Association Home Show. It was a huge success making impressions at the show and has already become our new favorite now that it is at home here in Geneseo. The island perimeter cabinetry for this kitchen is from our Koch Cabinetry line. 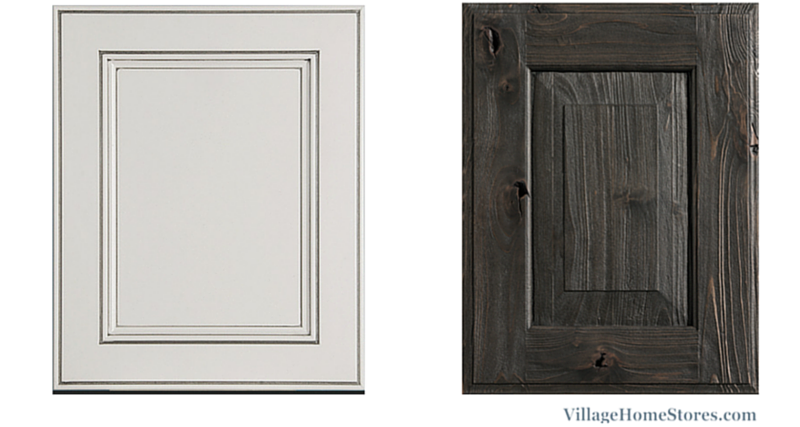 The smooth painted “Oyster” finish has been accented with a “Smoke” glaze. This gray accent is perfect when paired with the backsplash, stainless appliances and the island from Dura Supreme. 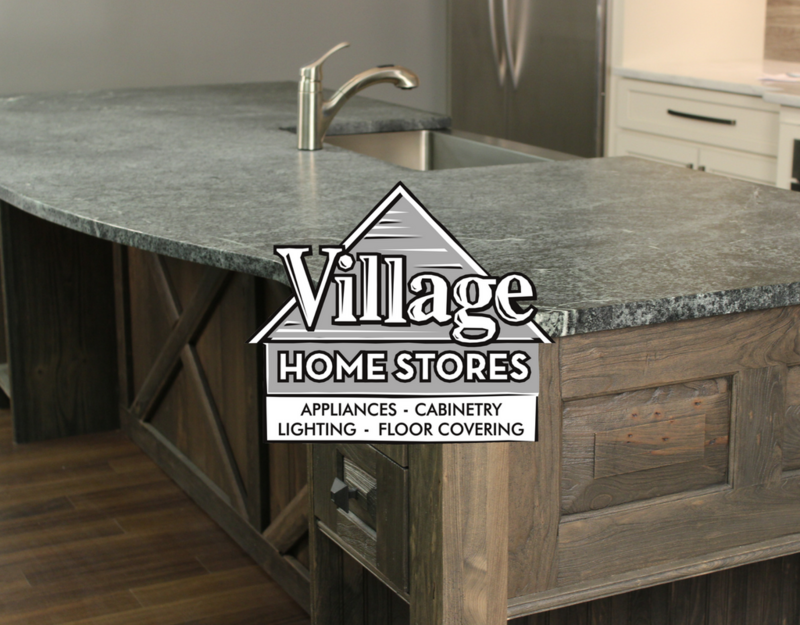 The island cabinetry is a rustic “Weathered E” Cherry finish. Dura Supreme has gone above and beyond to bring our customers amazing options with their Weathered , Heirloom, and Heritage Painted series of cabinetry. 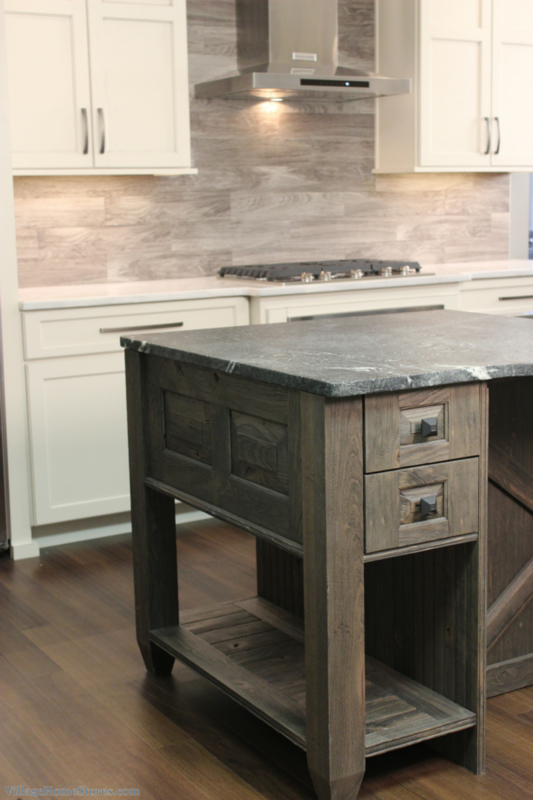 This weathered cherry island is something you truly need to see and feel in person. At the home show no invitation is needed to walk up and touch it. We watched people at the show walk from all the way down the aisle and right up to it to touch and see what the wood was. The same thing kept happening with this display’s backsplash. If it wasn’t the island cabinetry and top, the other most asked (and touched) part of this display was the wood “fake-out” tiles on the wall. These tiles give a look and texture that ties in perfectly as a compliment to the island finish. This material is actually a porcelain floor tile that has been installed as a backsplash. The tile is from our Paramount line in the Sandal Wood “Ocean Breeze” design. 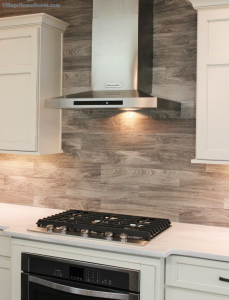 With the Diode undercabinet lighting system installed, the wood-look tile steals your attention right away! The KitchenAid® chimney-style hood becomes the focal point of the wall. Our most popular 30″ gas cooktop from KitchenAid® has a total of 5 burners below. An apron-front farm sink doesn’t have to look “Traditional”. With the right setting it can have a more modern style. 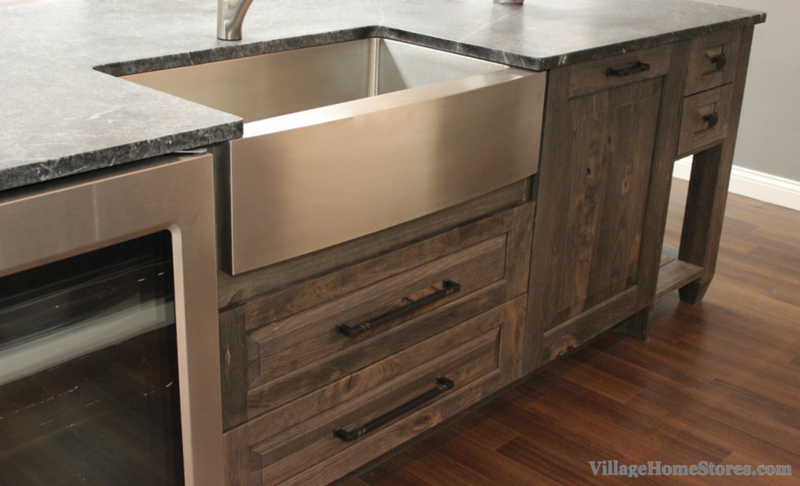 This Stainless Steel farm sink is a great example of just that. 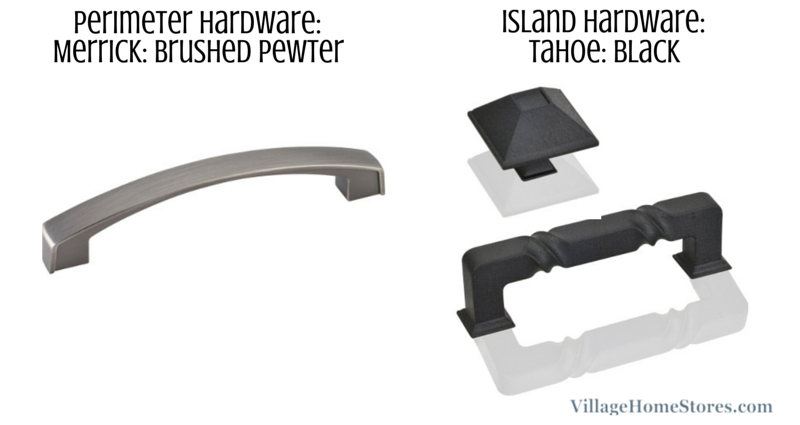 A white cast-iron sink would be to bold of a contrast in color and keep the island from having that solid, furniture look that we get with the look in our display. Not only are the cabinets in this kitchen different but the countertops are as well. 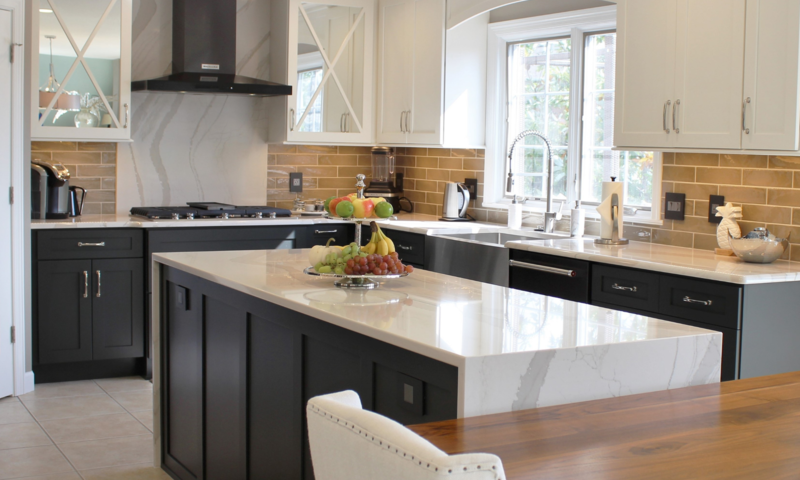 In this kitchen we paired Arabesque White with Natural Soapstone. We had so many questions about the soapstone top that we will be sharing a full product profile post on soapstone on the blog next week. With an island this incredible and a focal wall like the one we have here, a subtle light fixture was the right choice for this kitchen. 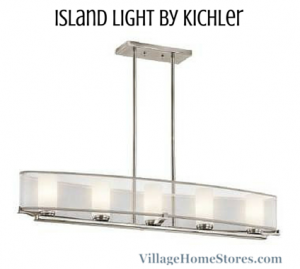 This kitchen design could warrant the use of so many types and styles of island lighting. Your possibilities are truly endless. 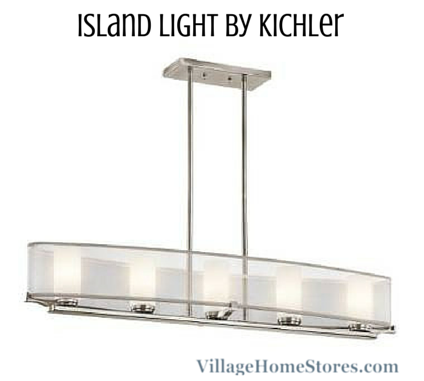 This transitional style fixture from Kichler compliments the metal finishes from this kitchen as well as the length and shape of of the island. Two large pendants would also work well here and frame in the centered sink and hood on the wall behind the island. While we love showing you our newest display kitchen in a tour here on the blog, you really need to stop by and see (and feel) it in person! 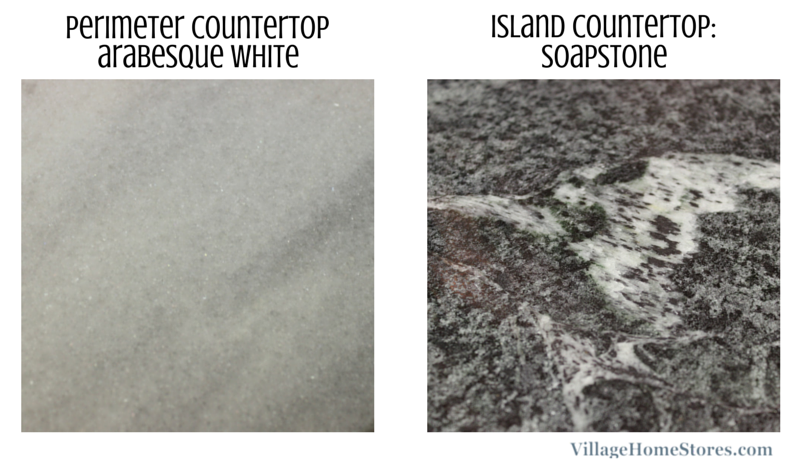 The weathered cherry and soapstone in this island are stunning in person. 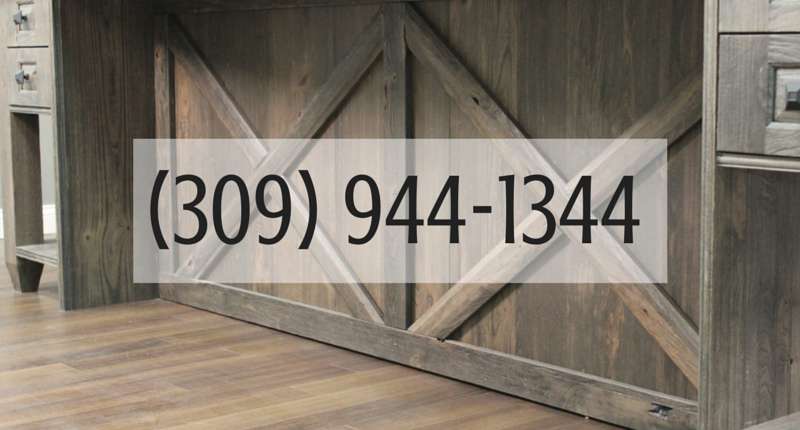 Call or click today for an appointment to get started on your project! Previous PostPrevious Trend Watch: Is Gray Here To Stay?